Word about Brin, and his amazing story and rescue, began to spread. Papers and radio stations continued to share his story and I was contacted by ITV as they wanted to film him for a Christmas special. Being still in quarantine I was worried about Brins reaction to having strangers in his relatively small space as I was still unsure of his capabilities when faced with certain situations. Mark was coming down too, as they wanted to include him in the interview, so that helped knowing he would enable Brin to feel secure. Everyone arrived on time and I had already spent time with Brin giving him a brush-up and his usual snacks to make him feel relaxed and ready to roll. He met all the new people with his usual charm, and seemed to be coping well, until the camera-man arrived and he reacted like I had never seen before. His tail went down and he became very guarded, running around the edges of his kennel and barking as if trying to escape. Mark mentioned that the camera looked very much like a gun that Brin would have been very close to while on patrol with the lads in Afghanistan and these memories were being well and truly triggered. I have to say I was not happy to see him so upset as this really showed the true power of memory for this dog and was certainly an eye-opener for all who witnessed it. It was decided to leave the camera on the ground for a while to allow Brin to sniff and check out the whole structure and this worked like a charm. He seemed to understand that there was nothing to be afraid of and the old Brin returned once more. The filming began and Brin was amazing. 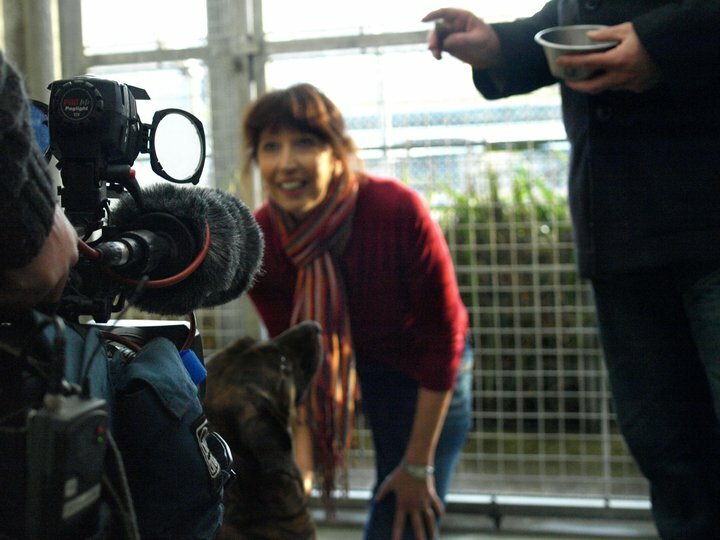 He sat and waited for treats and wagged his tail at Mark who was off camera keeping strong eye contact at all times. The filming took just over an hour and after they left I spent time with Brin just sitting and letting him relax by my side. The article went national and Brin’s story was soon being shared all over the world via his Facebook page. His fan base was building by the hour and the love that was growing for this little brown dog, from all over the world, was phenomenal.